Lights, camera, action…let the season begin for USU Eastern Theatre as they officially open their production and officially open the Peterson Black Box Theatre in the new Central Instructional Building this weekend. The rock ‘n’ roll, science fiction spectacle of “Little Shop of Horrors” opens the inaugural season for the state-of-the-art theatre. Corey Ewan, Ph.D., directs the play and is thrilled to be in this new space. “We have waited a long time for this type of performance space. We are now on par with any college/university in the state.” The theater is also the only fully functioning, LED space in Utah’s higher education system. “Little Shop of Horrors” is the classic, nerdy boy meets pretty girl, nerdy boy falls for unattainable girl (because of her pain and nitrous-oxide-loving-dentist boyfriend), meets man eating, alien plant who grants him his every desire in return for feeding it a “secret formula.” Basically a story we can all associate with, right? Little Shop is a throw back to the science fiction films of the ‘50s, but with a catchy-tune-filled score. The cast includes Price natives, Ben Jones and Christian Johnson as Audrey II, appearing on alternating nights. They performed in last year’s, “Les Miserables.” “They are absolutely hilarious with the role and the music,” Ewan says. The love-struck couple is played by Heather Bone, from Spring Glen, who is Audrey and Donnie Owen, from Panguich, who is Seymour Krelbourn, the boy with the plant. “They are delightful and have great vocal moments; very heartfelt and sad, with a sly sense of humor, Ewan said. Cameron “Bacon” West, from Mona, plays Mr. Mushnik, the owner of the failing florist shop that becomes Audrey II’s home. Josh Bone, from Spring Glen, plays Orin Scrivello, D.D.S., a sadistic, gas-guzzling dentist. Playing the Ronettes, a kind of Greek Chorus, ‘60’s-girl group that rounds out the cast include Chloe Clark, Stansbury Park; Jennifer Thomas, Castle Dale; and Rhiannon Bradley, Price; visualize this group as Hercules’ muses. There are a number of past actors in the chorus as well as some new faces. Ewan says the cast has worked incredibly hard on this production. “This group is here from 6 to 10 p.m. every night, working in a new venue, with equipment we have to break in. Brent Innes created a world in which the characters can inhabit and truly become part of. “Although minimal in scale to accommodate our larger cast, Innes created Skid Row, the setting for Little Shop. Brick walls, street corners and a phone booth symbolically putting us into this musical world where hope is at a premium. Yet in this depressing setting, the colors and graffiti on the walls help remind us that this is a comedic world as well. Audience members will find themselves so close to the action that they might get up and sing with the cast,” Ewan said. DeeJay Laughbon, has returned to her roots at USU Eastern to be stage manager. She received her BFA from USU and just got back from a tour as stage manager in Alaska and will leave for Tasmania after Horror’s close to be a stage manager for a cruise ship line. The costumer, Macy Lyne, is a freelance designer, originally from Price, working out of Houston, Texas, and all points where her work is in demand. Josh Roberts, from Kaysville, is a graduate of USU Logan and designed the lighting for Little Shop while Daysha Pedersen put together simple, fun and exciting choreography. She comes to us from Orem, Utah. “We are fortunate to have this caliber of talent working with our students. They get to see how professionals in theater work. To have our students see first hand the dedication, talent and hard work is an invaluable lesson, particularly at this level of their education,” Ewan said. 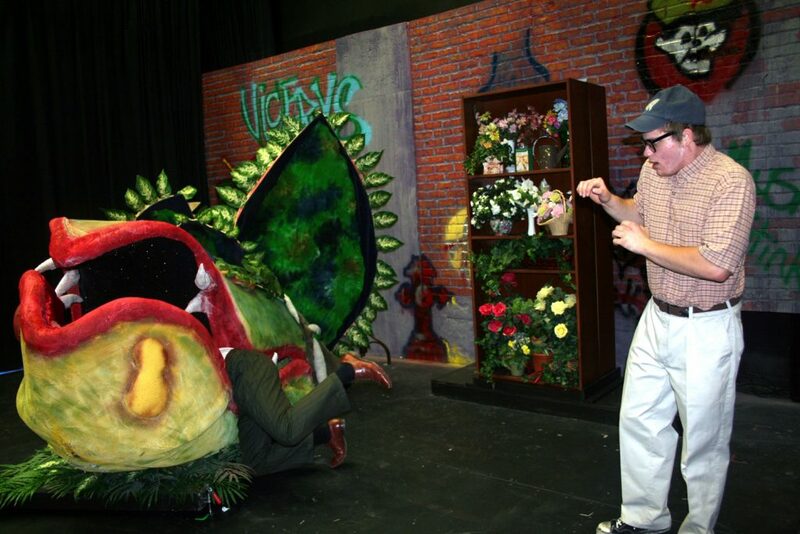 “Little Shop of Horrors” runs two weeks starting Thursday, Oct. 8 and continuing to the 17. Sundays are dark and on Saturday, Oct. 10 at 2 p.m., a matinee performance will be presented. Ewan hopes the community will join USU Eastern Theater in the grand opening of this exciting new performance space and this exciting, fun show.